D models (Reflectance Dependent) are used for single axis vibration and stroking motions, where the target reflectivity is constant. 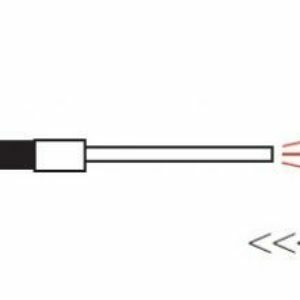 The output voltage function for D model sensors includes a near side region where the voltage rises with increasing distance, an optical peak region, and a far side region where the voltage output decreases with increasing distance. 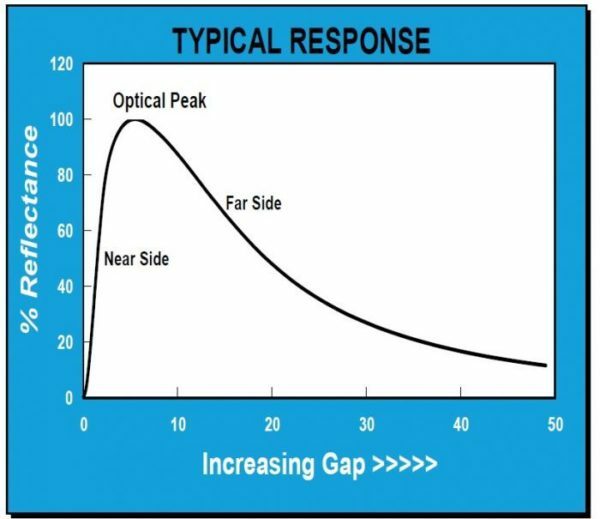 Operation in the near side region gives high sensitivity with limited operating range. 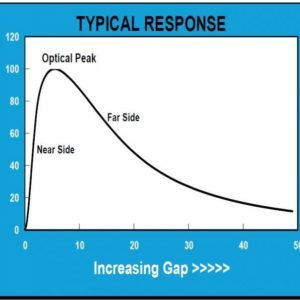 Operation in the far side region gives moderate sensitivity with greater operating range. 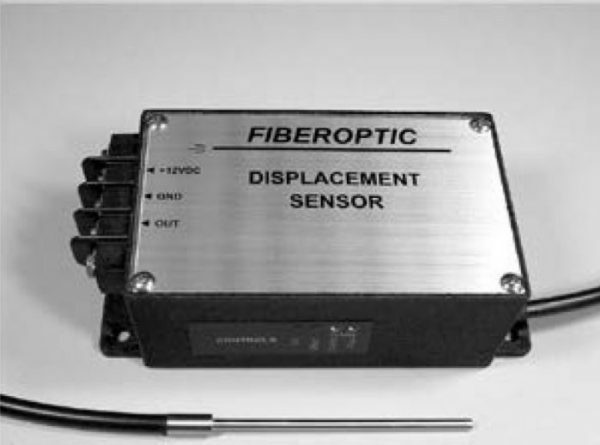 The D type fibre optic sensors are a family of very high performance non contact displacement sensors. With resolutions down to 0.004µm and measuring ranges from 20µm to 50mm, these units also have 100Hz, 20kHz and 200kHz + frequency capability. Their rugged construction and compact size means they are suitable for measurements inside of mechanisms, submerged in fluids and hostile environments. The sensors can measure any surface that reflects light. 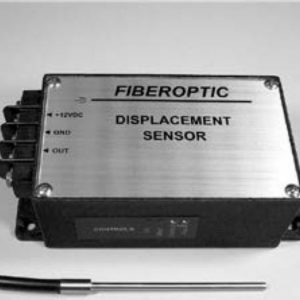 They are commonly used in applications where the target moves in the sensor axis such as vibration monitoring. 2B Connects sensor system with two inline connectors. Not available for all models..
— Standard Jacket: PVC Monocoil -PVC over a steel helical winding. semi-crush-proof, liquid-tight, not autoclavable or MRI compatible. Good to 105C. C1 Jacket: stainless steel interlock, crush proof, not liquid tight. good to 850c. C4 Jacket: corrugated – all plastic. semi-crush-proof, liquid-tight, light-weight, mri compatible. Good to 85C. C5 Jacket: ptfe over stainless steel interlok – vapor barrier, liquid-tight, crush-proof. good to 260c. C51 Jacket: ss interlok over ptfe – vapor barrier, liquid-tight, crush-proof, poor flexibility, good to 260c. C6 Jacket: PVC over nylon wrap – semi-crush-proof, liquid-tight, EMF compatible. good to 105c. C7 Jacket: ptfe tubing – autoclavable, MRI & EMF compatible, vapor Barrier, liquid-tight. good to 260c. C8 Jacket: pvc – polyvinyl chloride – very flexible, liquid-tight, EMF & MRI compatible, not autoclavable, not crush-proof. good to 105c. C9 Jacket: annealed (semi-rigid) stainless steel tubing. liquid tight. good to 850c. C10 Jacket: silicone over ss interlok sheathing. liquid-tight, crush-proof. good to 200c. C11 Jacket: polyolefin shrink tubing – thin wall moisture/vapor barrier, not crush-proof, poor flexibility. good to 150C. C12 Jacket: polyolefin over ss interlok – thin wall moisture/vapor barrier, crush-proof, flexible. good to 150c. T8 Tip: high temperature, 350°c max. T9 Tip: high temperature, 480°c max.